Do old people hurt growth? A new paper (PDF) claims that ageing populations will hinder growth by both dis-saving and dragging down innovation, thus reducing productivity. Using a VAR model, they relate the age structure to measures of growth, saving, investment, and other macroeconomic variables over the 1990-2007 period. They use those coefficients to predict the effect of demographic change on growth rates in the current decade. 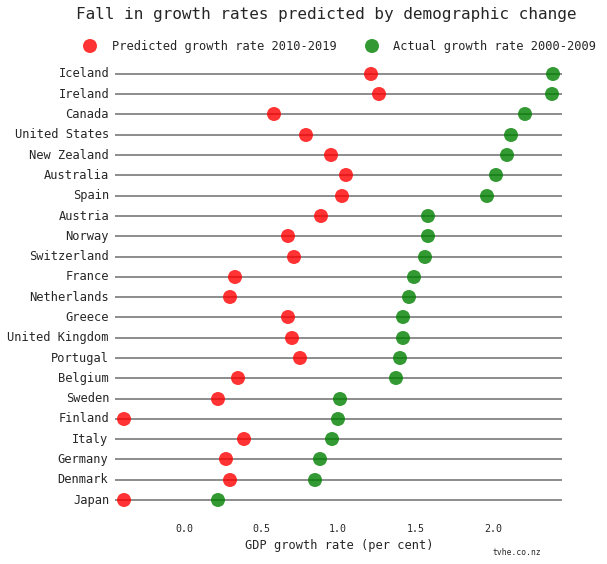 The results are dramatic, predicting that an ageing population will knock over a percentage point off some countries’ growth rates. As workforces age, employers are concerned that productivity will decrease. That is not so. What matters is not chronological age but subjective age. The research suggests that older people are systematically excluded from training activities, and are relegated to less creative and meaningful work, which renders them less productive. As the workforce ages, that may begin to change. As it changes, the relationship between growth and age structures is likely to weaken. http://www.tvhe.co.nz/wp-content/uploads/logo-for-enfold-photoshop.png 0 0 jamesz http://www.tvhe.co.nz/wp-content/uploads/logo-for-enfold-photoshop.png jamesz2015-04-10 05:33:542015-04-10 05:33:54Do old people hurt growth? Performance pay for the public sector? PRP schemes can be effective in improving outcomes across the three public services for which evidence is available (health, education and the civil service), although the central conclusion is that the outcomes from PRP are mixed, which much dependent upon organisational and occupational context and scheme design and implementation. Where positive effects have been found, effect sizes are sometimes small and may also be short-lived. As well as evidence gaps across much of the public services, the weight of evidence also varies, with the more robust evidence coming from education and health rather than the civil service. Cost-effectiveness data to assess the value for money of PRP interventions is also rare. The implication is that performance-related pay isn’t a quick fix: it requires careful development to fit it to the context, and organisations might take a while to adapt to it and see benefits. Without more examples in the public sector it isn’t possible to say whether it will prove cost-effective. http://www.tvhe.co.nz/wp-content/uploads/logo-for-enfold-photoshop.png 0 0 jamesz http://www.tvhe.co.nz/wp-content/uploads/logo-for-enfold-photoshop.png jamesz2015-01-17 04:23:202015-01-17 04:23:20Performance pay for the public sector? I see that Patrick Nolan has an article in Public Finance talking about UK and New Zealand productivity. Go read it, but come back here to comment as they don’t seem to have a comment system. While New Zealand faces different challenges, its experience can throw light on the UK’s situation. OECD research recently published by the New Zealand Productivity Commission has shown that the country has good resources – investment in physical capital and average years of schooling are broadly consistent with other countries – and policy settings. It is one of the easiest countries in the world in which to set up a business and its tax and regulation regimes are often seen as world class. Indeed, the OECD estimates that New Zealand should have GDP per capita 20% above the OECD average. But its productivity performance means it is 20% below. In short, New Zealand poses a real challenge for standard prescriptions for what countries should do to lift their productivity performance. Recently I’ve been talking a bundle about inequality in incomes, and fitting it within an idea of “equity”. However, as we’ve chatted about, policy choices often involve conceptualising an equity vs efficiency trade-off. A fundamental part of how we understand where we are in relation to this trade-off, especially with reference to “efficiency”, comes from thinking about productivity. With this in mind, the Productivity Commission has been thinking about New Zealand’s productivity performance. And given that along many characteristics New Zealand and Australia are similar they have decided that looking into the productivity gap between these countries helps us to understand this issue. This led them to release a working paper titled “Investigating New Zealand-Australia productivity differences: New comparisons at industry level” on their main site (links can be found here).